All possible causes for the explosion in the St. Petersburg Metro are being considered, including those linked to terrorism, Russian President Vladimir Putin said. “The causes of this event have not been determined yet, so it’s too early to talk about [possible causes]. The investigation will show. Certainly, we will consider all variants, common, criminal, first of all, of a terrorist nature,” he said. Vladimir Putin is currently in St. Petersburg taking part in the All-Russia People’s Front media forum that opened on April 1. He arrived at the Tekhnologichesky Institut metro station in the evening and laid flowers to pay tribute to the victims killed in the blast. 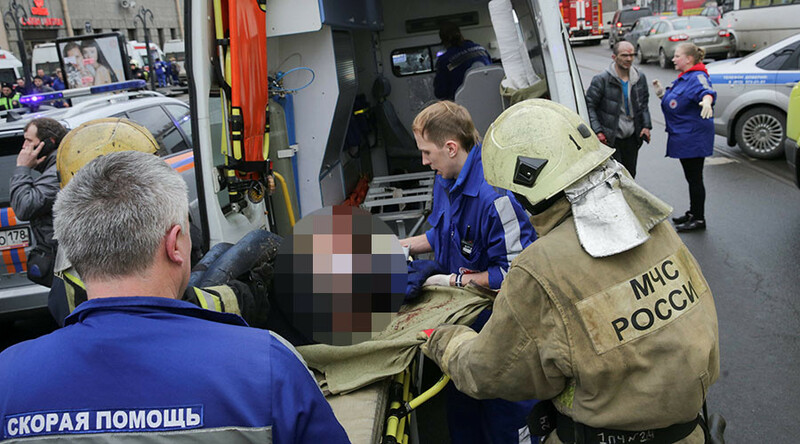 Kremlin spokesman Dmitry Peskov has denied earlier media speculation that President Putin was due to pass by the Sennaya Metro station around the time of the blast. The explosion happened between the Sennaya Ploshchad station and Tekhnologichesky Institut at around 2:40pm local time, Russia’s National Anti-Terrorism Committee said. The blast was caused by an unidentified explosive device, officials announced, adding that all metro stations in St. Petersburg have been closed. The metro is “basically” fully evacuated, according to Russia’s National Anti-Terrorism Committee.